This is a great option for organizations looking to maximize local impact. 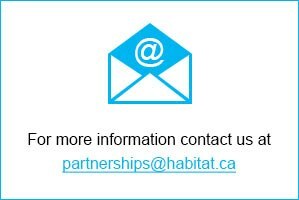 With a Habitat Home Sponsorship your team will participate in the construction of one home over multiple Habitat Build Days (up to 10 per home sponsorship). As a Habitat Home Sponsor, your employees will have the opportunity to participate in the construction of a Habitat home from start-to-finish and meet the family whose lives they are transforming. Habitat Home Sponsorships are available across the country year round.